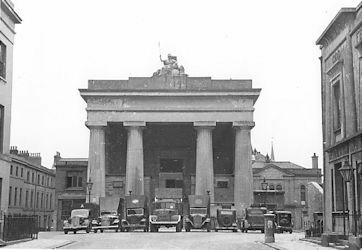 Devonport's Town Hall shielded by ARP vehicles in 1942. Plymouth Dock was not sufficiently ancient to have had trade guilds running its affairs so it never had a Guild Hall like Plymouth. All the town's business was dealt with at the Workhouse. But its inhabitants did aspire to having a Town Hall, to which they subscribed in shares of £25 each. They were to receive their dividends from the income of letting out the main hall and its adjoining rooms. The celebrated Plymouth architect, Mr John Foulston, drew up the plans for a building in the style of the Parthenon in Athens and the contract for the construction was let to local contractors, Messrs Rickard and Bartlett. The site was given by the Lord of the Manor, Sir John Saint Aubyn. The first stone was laid in June 1821. In addition to the spacious main hall, which measured 75 feet in length, 45 feet in breadth, and 31 feet in height, there were rooms for the magistrates, the overseers of the poor, stores-rooms for lamps and paving tools, a watch-house and cells for the police force, and an engine-house for the fire brigade. There was even accommodation for the Plymouth Dock and Stonehouse Classical and Mathematical School. The entrance was guarded by four massive Doric columns and a colossal figure of Britannia that was donated by Mr R Burnet. The court of quarter sessions and the weekly police court were held every Wednesday in the main hall, in which there were portable benches that could be removed when the hall was needed for civic functions. Those gathered in the Hall were able to admire a fine collection of portraits. After the amalgamation of Devonport with Plymouth and Stonehouse in 1914 the Town Hall ceased to be used for civic functions and in 1919 it was taken over as the Town's Labour Exchange. Luckily it suffered little if any damage during the Second World War and still stands in use today.